Another basi(stale) post. 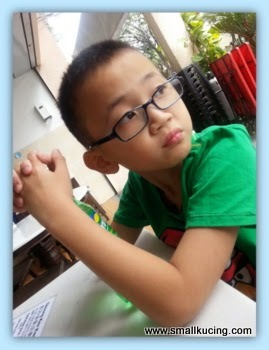 Went to Damansara Jaya one of the days as Papa had something to do there. Hmm.... Lunch hour liao. Don't know where to eat. Saw this Claypot Chicken Rice Shop. 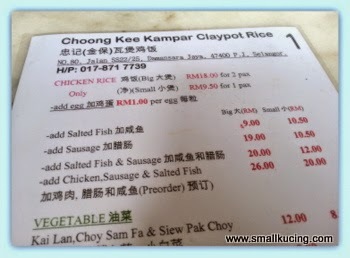 Mamarazzi said since long time haven't have Claypot Chicken Rice so try out la this shop. From the menu....hmm...what to choose ah.... By the way...this is before the GST ...now price may not be the same anymore. In the end we choose the one with salted fish and Chinese sausages la. Taste wise, for Mamarazzi okay la. Taste average but they were quite generous with the salted fish. Love Claypot rice that have salted fish. add to the flavour. Ordered the peanuts soup too. Must have been boiled very long as the peanuts was soft. Just nice. Kinda hard to get. Nothing can go wrong with ngapou chicken rice, especially with salted fish and lap cheong somemore.. The rice must be so fragrant and flavorful.. I can eat 2 pots! I love claypot rice! Chicken or pork. With lots of salted fish. Hehe. 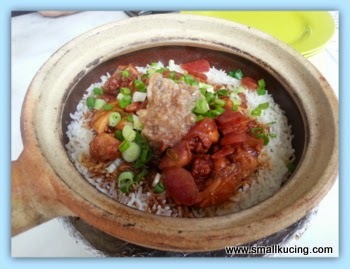 Claypot rice with salted fish is simply superb. Not too bad the one you had. I love claypot chicken rice. Will sure ask for semua taroh. Chicken and rice sounds good to me ... especially left over chicken smothered in béchamel sauce ... served over rice ... so yummy ... try it, lil kitten ... smiles ... Love, cat. Thank you for visiting my blog and leaving a nice message. What a lovely and interesting blog you have. 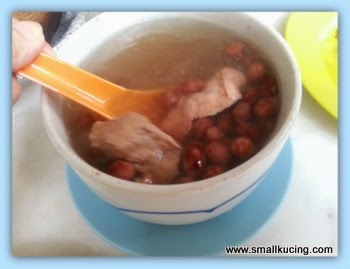 We used to enjoy clay pot rice quite often in my area but now so sad lo.....the uncle no more selling. I like to eat nga pou chicken rice but can't eat too much, hehe!! I like claypot chicken rice and this definitely looks good for me!